Canada’s central bank surprised many when it lowered it’s trend-setting overnight rate from 1 per cent to just 0.75 per cent on January 21st. The move came ahead of the release of the December 2014 CPI figures, which confirmed a continued decline in growth and inflation. Falling oil prices over the last six months are bringing Canada dangerously close to deflation territory. The cut in interest rates was made in hopes of counteracting the threat to financial stability that the lower oil prices pose. Raising and lowering interest rates is the most effective weapon a central bank has in trying to influence the direction of the economy. When inflation is high, central banks will often increase the overnight rate in hopes of slowing the economy down. In times of low inflation, it will do the reverse and lower the rate. In Canada, large banks borrow from and lend funds among each other on the overnight market. This occurs the end of each business day and the funds are traded for very short periods of time in order to offset a shortfall or a surplus that results from regular operations. The central bank will influence the overnight rate by using its reserves to either lend to or borrow from the banks directly. 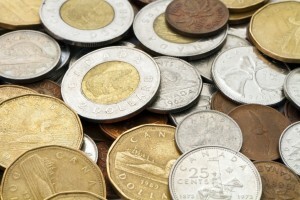 The overnight rate often sets the trend for interest rates that are charged to Canadian consumers on the retail market. A significant portion of debt held by companies and people is in the form of variable rates, which are generally pegged to the overnight rate. When the Bank of Canada lowered the overnight rate, it effectively also attempted to lower the interest rates charged to companies and consumers on the regular market. This action is thought to spur on economic growth in two ways: putting more money in consumers hands, and making savings less attractive. As interest rates go down, the payment needed to service a debt goes down as well and therefore makes it easier for people to borrow more. At an annual rate of 4 per cent, a borrower would have to make a payment of $2,111.35 every month in order to repay $400,000 borrowed over 25 years. That same payment would be only $1,896.85 at a rate of 3 per cent, but would jump to $2,338.36 if the rate went up to 5 per cent. At lower required payments, banks are able to lend more money to the same customer. When consumers borrow more, they tend to feel wealthier, which causes them to spend more. As spending increases, businesses respond to higher sales by ordering more materials and by increasing production. This in turn can lead to higher employment and economic growth. When the overnight rate falls, banks often respond by also lowering the interest they pay on deposits held by their customers. Lower interest rates make it less attractive for people to keep funds on deposit, and more attractive to spend or invest instead. Spending increases production; and investment increases growth. Such investment is sorely needed in Canada at the moment. The Canadian Association of Petroleum Producers estimated that oil companies in western Canada will respond to lower oil prices by reducing capital investment by as much as $46 billion in 2015, a drop of roughly 33 per cent. Historically, the current overnight rate of 0.75 per cent is well below average. For the years of 1990 to 2015, the average rate was 6 per cent. The all time high for the overnight rate was 16 per cent in February of 1991, while the lowest the benchmark rate has ever been was 0.25 per cent for the months following April 2009. The central bank has used its control of the overnight rate to affect inflation before. In late 2009, the inflation rate rose quickly, increasing from -0.86 per cent in September 2009 to 1.84 per cent in April 2010. The central bank reacted to the fast rise in inflation by increasing the overnight rate several times, raising it from 0.25 per cent in May 2010 to 1 per cent in September 2010. Inflation initially continued rising and briefly went well above the central banks targeted inflation rate of 2 per cent. But once the effects of the higher overnight rate set in, the inflation rate fell back into the acceptable range and remained there for the next few years. The current inflation rate is still well above where it was in all of 2012 and 2013, but is falling rapidly. That is likely why the central bank made the move. While inflation may have been lower in 2012 and 2013, the situation was also much more stable. It is the uncertainty and the speed of the current developments that have the central bankers worried. In lowering the overnight rate they hope to be able to cushion the fall in employment and income brought about by the lower oil prices. Lower interest rates will hopefully give firms outside of the energy sector room to increase spending and production, and ride on the coat tails of a recovering American economy. Exports from provinces such as Ontario and Quebec could potentially offset some of the decline experienced in provinces such as Alberta and Saskatchewan.